Cameron Mooney is a triple premiership player with Geelong and North Melbourne. His success on field has continued with his transition to in-demand media performer. Raised in Wagga Wagga, he was drafted in 1996 with pick 56 by the North Melbourne Kangaroos. In his first year he played 11 games, breaking his way into the club’s premiership team at only 19 years of age. In 2000 he was traded to Geelong and made his name as a mobile ruckman and forward. 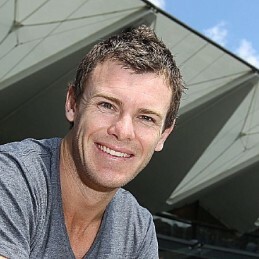 Cam was a significant contributor to the club’s rise to sustained premiership success. In 2007 he won his second premiership, kicking five goals in the grand final, and was named in the All-Australian team. Geelong narrowly lost the 2008 premiership but the 2009 premiership made it three premierships from four grand finals. In the 2010 season he played his 200th game but an injury riddled 2011 season saw him announce his retirement from the game. He finished with 221 games played, 297 goals and three premierships. Now a well-respected commentator, Cam is part of Fox Footy’s gameday broadcast team as well as a panel member of AFL 360, a regular on SEN radio and writes a column for the Geelong Advertiser. Cameron’s presentation and media skills have made him favourite with corporate and community groups.